A Terminator movie without the mother of the Resistance is no Terminator movie at all. Justin Lin, who has directed multiple The Fast & the Furious movies and is attached to the Highlander reboot, says that the Terminator movies just aren't the same without Sarah Connor, and that he might look at bringing her back for Terminator 5. Lin said that Connor's off screen death between the second and third movie, not to mention how little Terminator 3 mentions it, had surprised him, as she had previously been a massive part of the franchise. But she didn't have to stay dead forever, he said, as time travel meant that there was always an avenue for characters to come back to life. "I think the great thing about this franchise is you have... You can actually have different canons because you have the element of time travel. So, there's a way of kind of respecting all the works but also able to create a new time line," Lin explained. 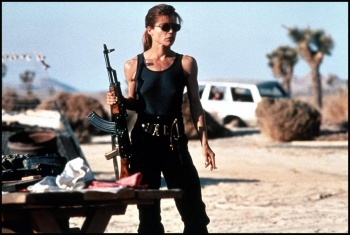 Of course, the real reason that Sarah Connor didn't get the big send off she deserved was that actress Linda Hamilton didn't want to reprise the role in Terminator 3, and it's not known whether she'd want to in Terminator 5 either. However, according to rumors, Terminator 5 could be a reboot of the series with a new cast, so maybe it could have Connor without Hamilton.